I will also be moving over posts from this blog to my website... and as I do I will be editing the posts and new reflections will be added... as I find in the 6 years that I have been blogging I have learned so much more and evolved in my own reflections... so I feel my posts should reflect that too. 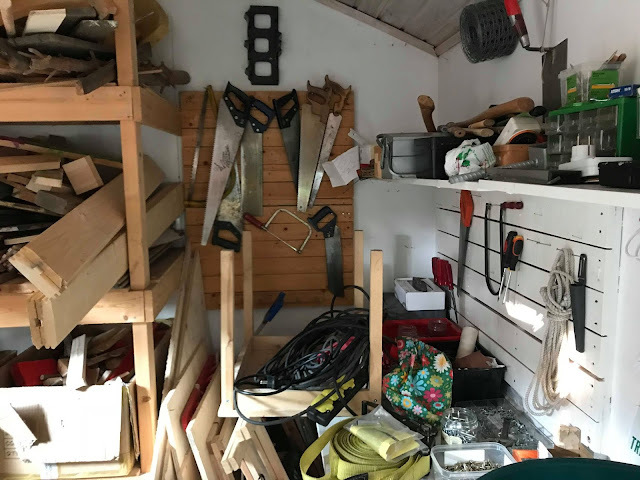 there are other pages to explore on my website too... including workshops and presentations that I hold... this will be a work in process... as I learn more, there is the opportunity to share more. Thank you to everyone that has been coming to this blog and reading my posts... and for the feedback I have received over the years. I hope that you will make the move with me to my new website and that we can continue to reflect - so your feedback is always appreciated. it is the season for a whole array of traditions and celebrations around the world. But this one will be with a slight difference. It is not about doing specific arts and crafts... but about experiences that help you and the children understand, enjoy and explore the holiday/s you are celebrating. Taking the time to find out what the children already know about the celebrations. How do they celebrate at home? Do they all celebrate in the same way? What are the similarities and what are the differences? With the youngest, non verbal children you can use story books to talk about the traditions, or go for walks to see if there are any signs of the celebration outside (this can be done with older children too, of course). What colours and what symbols do the children connect to the celebration? Why do they make these connections? When I asked these questions to a group of preschoolers over three years - their answers about the colour of Christmas changed and became less connected to their favourite colour and more connected to observations they had made about the celebration over the years. 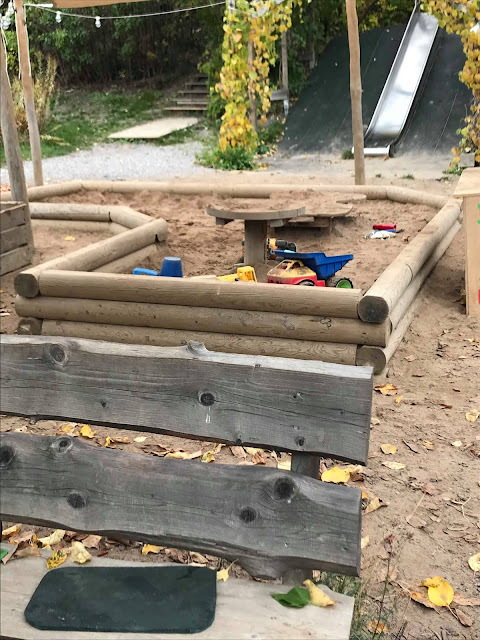 By knowing what colours and symbols the children connect to the holiday, these can be introduced into their play environment to enrich their play. For example... for some children it is about the presents... so by introducing the opportunity for the children to make their own wrapping paper, make small presents, or small boxes, that they then can wrap themselves is a fabulous way for children to explore this art of making and giving presents in their own way. It is also a great way to think about maths (cutting the paper to the right size to wrap) about fine motor skills (it is so fiddly to use tape and fold the paper) - social skills, the idea of giving and receiving, thinking about what others might like, and not just giving what you like to someone else. like this cinnamon goo . Smell is such an important part of memory... it is one of the senses that can really remind us of things - so I feel it is a sense that should be used more. BUT it is also a sense that can easily overwhelm some children, so it should always be used with consideration... does it overwhelm a whole room, can it be used in a way that allows a small group to experience the smell and not impact everyone... a small room maybe, or not too much aroma added. 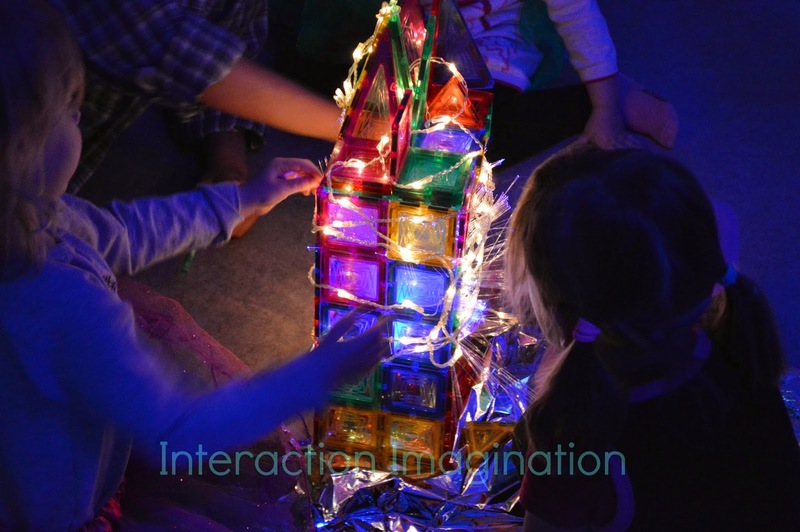 Another sensory experience that is connected to several holidays is light. 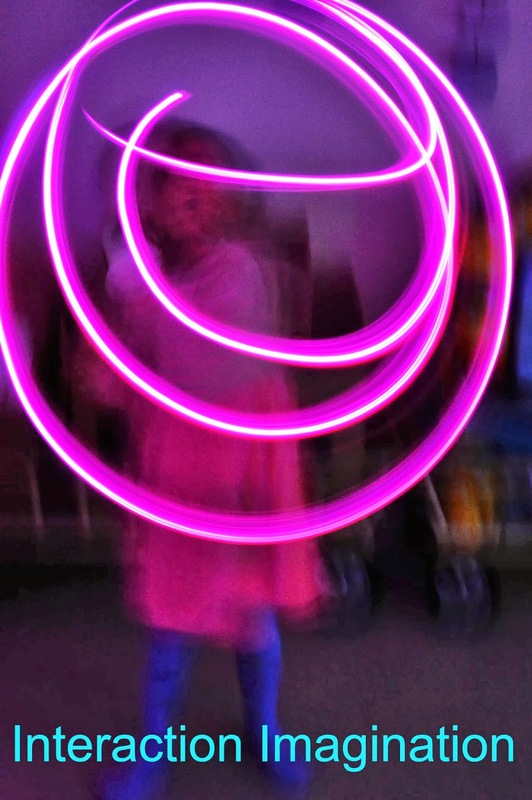 Allowing children to play with light is another great way to experience the holiday. 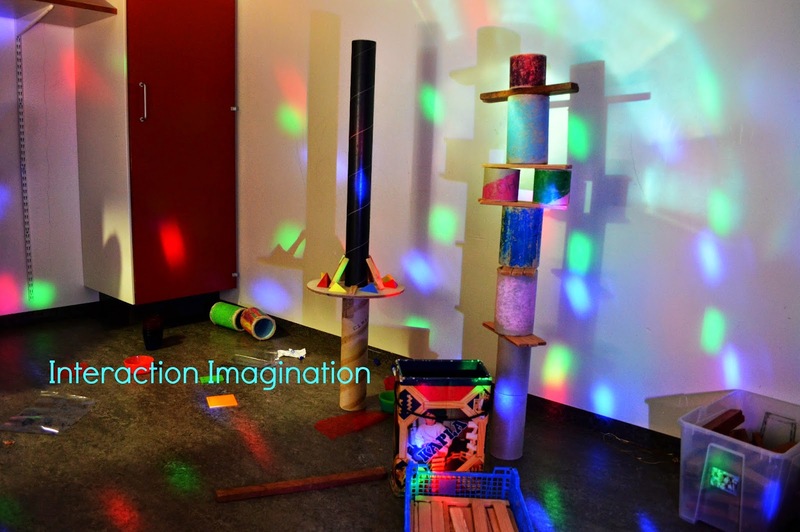 This can be done by adding strings of battery powered light to the construction area, or projecting holiday inspired images onto a wall... that the children can use large loose parts to create holiday inspired constructions/play areas, or drape semi transparent fabric from ceiling to floor to catch the the images on their way to the wall. 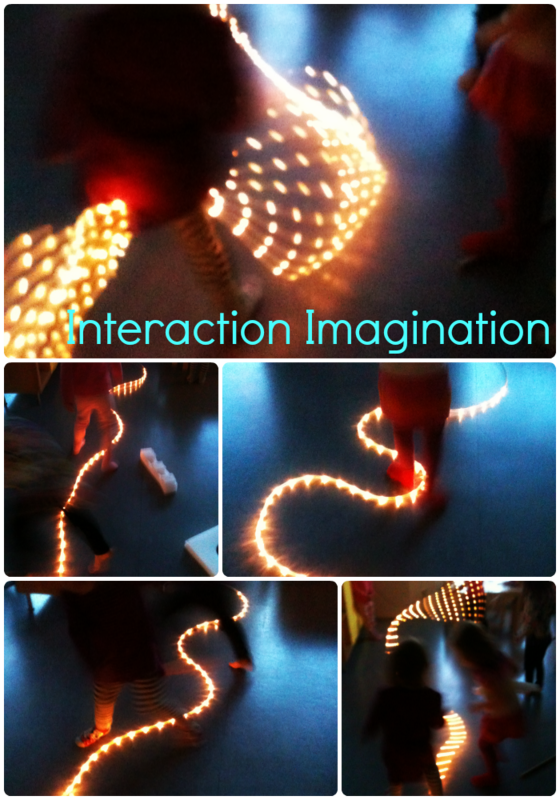 This is a great way for the children to climb inside the magic and experience the light in a new way. 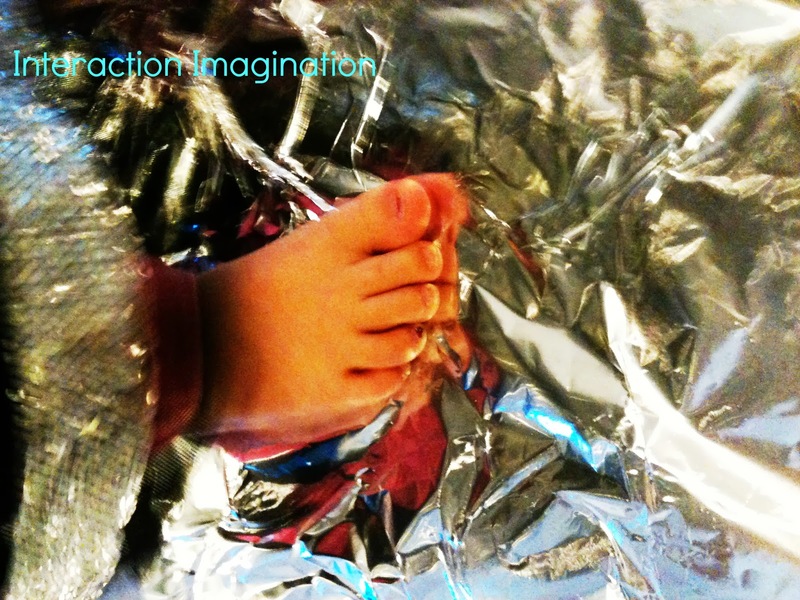 Survival blankets (the silvery foil sheets) are also great for this kind of light play - as is bringing in natural loose parts. There are lots of play opportunities to explore traditions and celebrations. It is about listening to the children and then introducing the materials into the environment for the children to explore in their play. 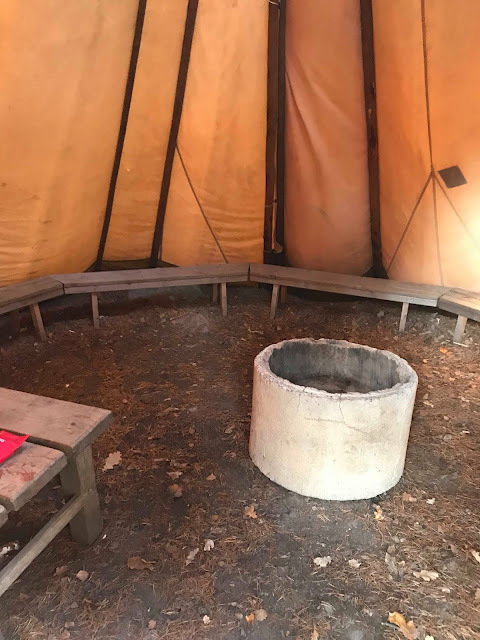 I also think that it is important to include some of your traditions too, things that the children have not thought about... allow them to be a part of the resources and see if the children connect with them too... often they have sen them at home too, but have not recollected. 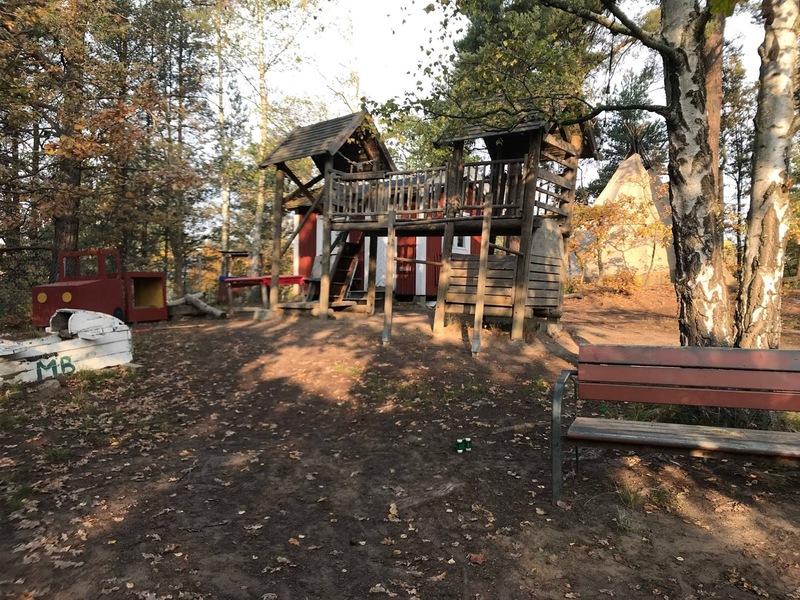 The children's play will encourage you to think about what more materials and what other activities could be provided to support the children understand their own traditions. Baking is another sensory experience... touch, smell, taste, sight and sounds will all be activated as they bake/cook things that are connected to the holiday/s. Every year I have baked pepparkakor (spiced biscuits) with children, as do most settings in Sweden. In part to prepare for the parents coming on the Lucia celebration and in part because it is just such a great activity. What I do on at least ONE of the sessions of baking pepparkakor is not to provide cookie cutters, but just rolling pins and knives. 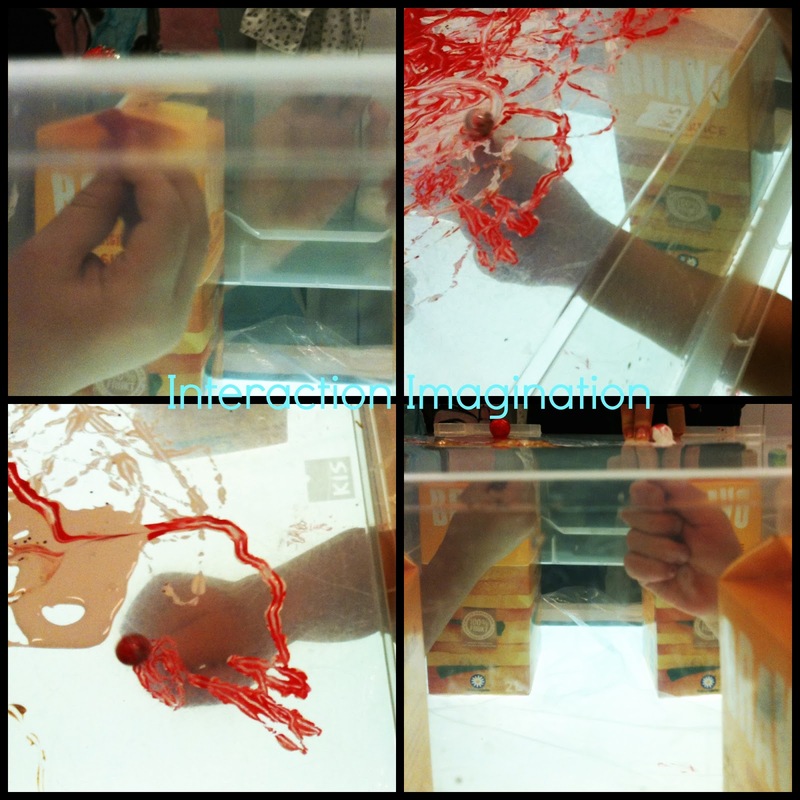 To encourage the children to think creatively about what shape they want to create, and how to make it. Some children will just make lots and lots of cut marks in the dough, and then realise that this does not work, so they re-roll and start thinking about how to cut out a shape. 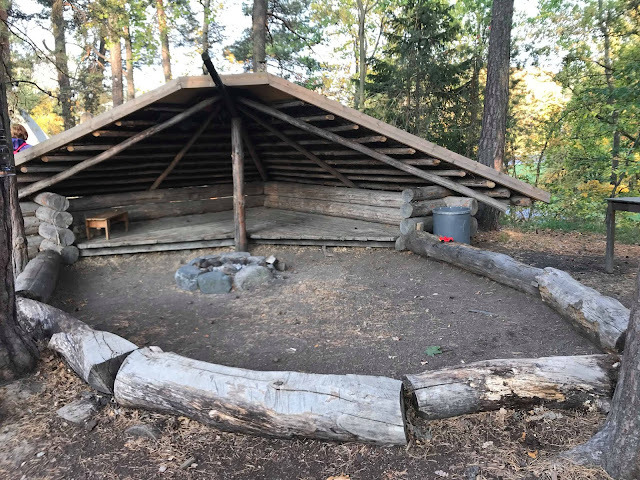 Others create elaborate shapes of goats, tomte and hearts (all traditional Swedish Christmas symbols) while others are happy making squares and triangles. In their second session they get the cookie cutter and a knife - so they can choose. There is something very satisfying about using a cookie cutter - but at the same time I like to question it, and challenge the children to think about there is not just one way of creating cookies. I did the research into the food, found the recipes, and the kitchen prepared them. 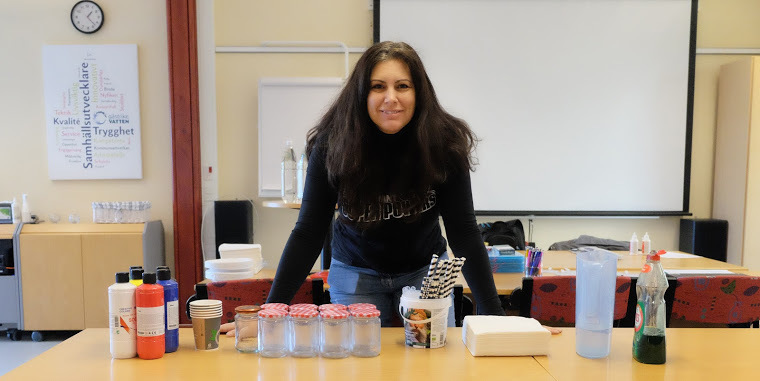 I also prepared short information sheets with each lunch so that the educators could share with their children where in the world the food tradition came from and a few other Christmas traditions from that area. All with the intention that the same thing can be celebrated in many ways. There is not a single story of Christmas, or any holiday, there are many stories. 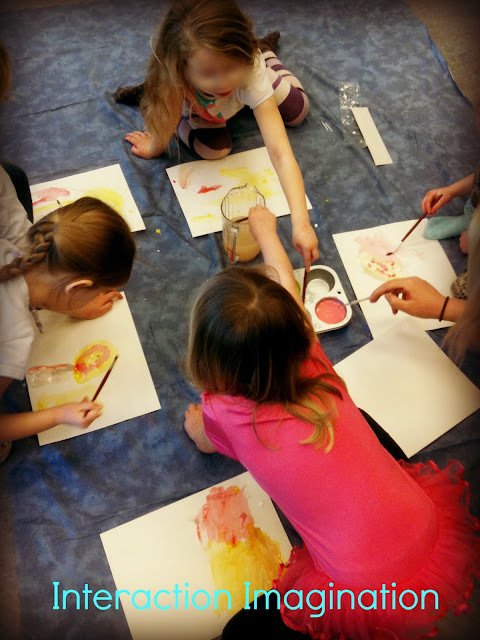 Using paint and other art materials is a great way to explore traditions. As I mentioned already above, one of my favourite ways to paint Christmas has started with a dialogue to find out what the children think is the colour of Christmas. 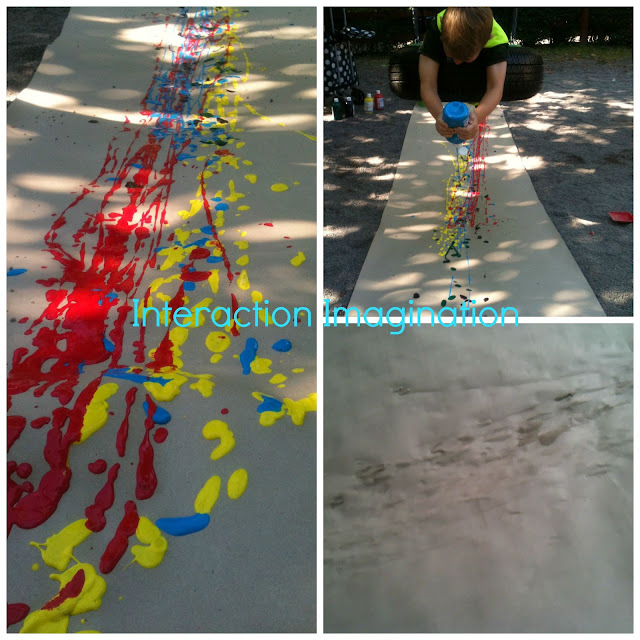 And then we have used those colours to create art with... and in different ways, and nearly always collaboratively. As you can see in the film above, using the chirstmas colours on the light table I combine playing with light and the symbolism of colour. I was also intrigued how I could influence the children's work by starting to sing... as when I did it influenced what the children started to draw in the paint. We, as adults, have so much power... what we say, what music we put on etc will impact how the children play and what they do. The colours have been explored on the light table, using magnets and also with a brush danglinf down from a pole... there are SO many ways that the holiday can be explored through colour, and knowing your children's needs will help you make that decision... is it individual work, or team work, sensory exploration or more formal paiting with a brush... will you paint with holiday resources... like cookie cutters, tinsel/decorations etc - there is really so many possibilities. I did this during summer... but for some, this season of holidays is a warm period... so using the holiday colours to create a collective artwork like this could be an option. 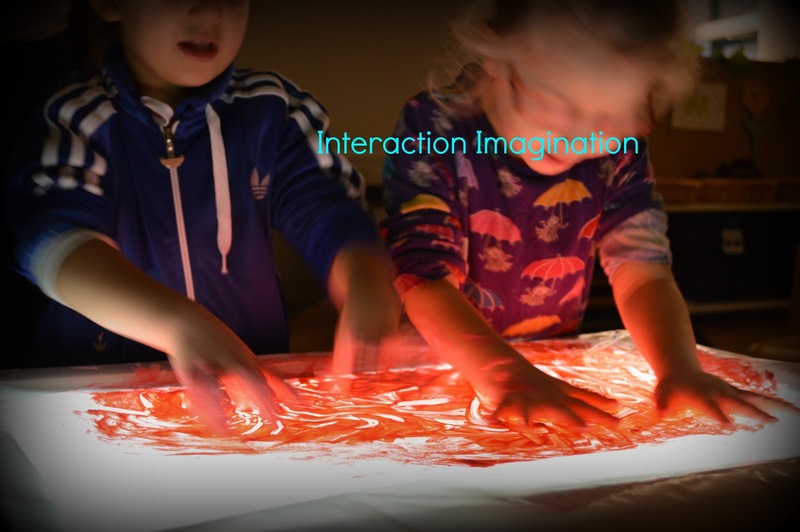 It does not use more paint than the light table option... and then the artwork can be used as a background for continued exploration of the holiday. In the above image I used food extracts in liquid water colours that I diluted. I have done this many times, and in different ways... individually, pairs, large groups. They have all worked. For children with special needs I have done this FIRST individually, so that they had time to experience the sensory process at their own pace... so it did not become overwhelming of dealing with the sensory and the social at the same time. Those that were comfortable got to do it again in a group if they wanted. By doing it individually with these children I could adapt it - like wearing gloves, or putting plastic over so that they did not get messy, but could still participate. Another art/creative approach is to put out a smörgåsbord of materials for the children to choose from to create their own arts and crafts. 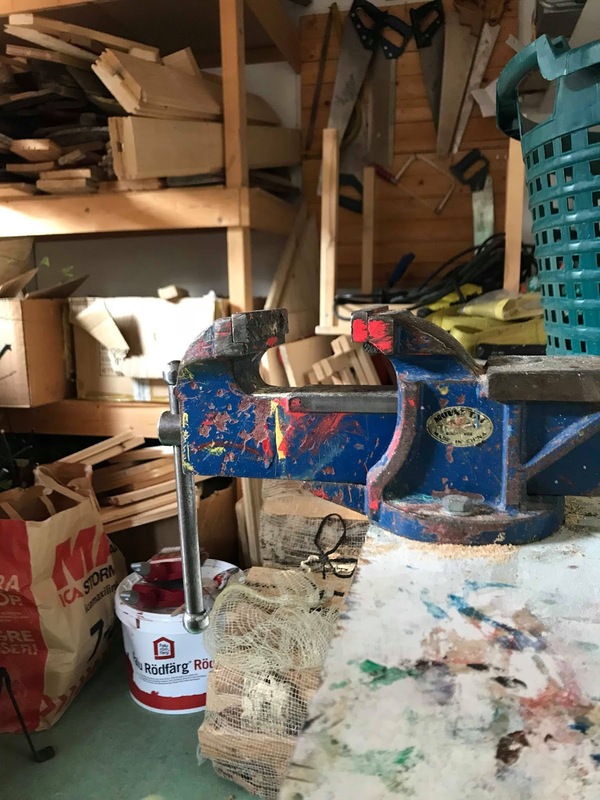 These can be loose-parts inspired by what the children have described as belonging to the holiday, or symbols, colours, paper, decorations etc in the atelier that the children can choose from to create collages, or loose-part art that can be created and recreated and saved by taking a photo. A buffet of holiday resources that the children can play and create with. Not set activities so all the children make the same kind of christmas tree, or menorah, or rangoli design they fill in... (even if the children inspire each other, and some things do end up being almost the same, this is the choice the children make themselves). 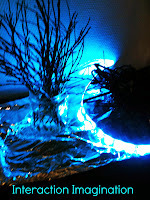 If you have been talking about the celebration the children will have plenty of ideas... or they may simply be inspired to create something unrelated to the holiday with new kinds of materials... its is all learning.. for the children and for you. Song, music making and dancing - these are things that are often connected to celebrations and traditions. Learning songs together, dancing to traditional music, making Instruments that create sounds that connect to the holiday. Making music that sounds like the celebration. Often at this time of the year children perform for parents. This can be stressful for some children.. and a moment of joy to shine for other children. My last four Lucia celebrations with preschoolers has been done in a communal way with the parents... instead of performing for the parents the 1-5 year olds get to sit with their parents and sing together with them. The song lyrics are projected onto the wall so that all can sing along... and there is space in the middle for those children who feel the need to dance, sing and perform. It is a relaxed and joyful event of togetherness. Afterwards time to eat those pepparkakor!! Right now I am sitting on a train on my way to see my daughter, who is attending high school on the other side of Sweden. The things that happen when your dream is to study marine biology! 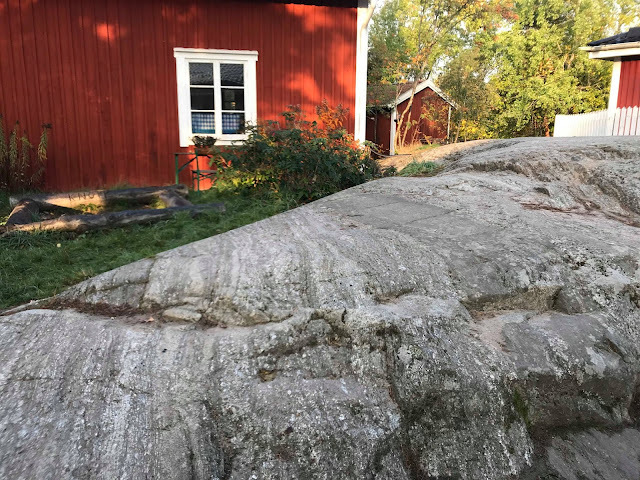 But sitting on this train has got me thinking about the phrase I often use... "learning journey" and also reflect on a facebook interaction yesterday evening with Mats Olsson about "following instructions" and their connection to the Swedish preschool curriculum. So we need to explore the words "follow" as well as "instructions" - what do theses words mean to us and how do we put them in practice. Do we make children follow instructions - sit still, listen quietly etc - a kind of traditional classroom sort of obedience to the sense of following instructions. 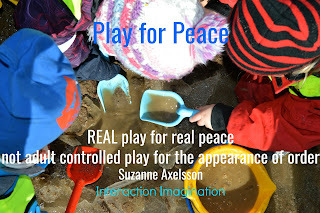 Real Play for real peace.... NOT adult controlled for the appearance of order. I think many instructions are put in place for the APPEARANCE of order and calm...an adult controlled peacefulness, not a natural organic kind where the children self regulate and interact skilfully with each other. Talking of getting places... back to the train and the learning journey. I got to see my first sprinkling of snow from the train today. I love the first snow of the season, deep inside there is this child that just needs to get out and connect with it... touch, make footprints... you know what I mean. So being on the train meant I could not do what I wanted. Its felt rather disappointing. But I am old enough, and wise enough, to know there will be another chance to meet the snow. Sometimes I think the education is a bit like a train track... sure the learning journey is there, but there is a clear starting point and a clear destination. There is no flexibility in how we get there. we get on the train, the train follows the track... and if there are no delays we arrive on time at the chosen destination. Standardised tests is very much a train track of learning. There is no opportunity to explore what is between the stations... you just get glimpses. There is a certain level of freedom on the train, but we are still confined to the train and what the train has to offer (or what we bring onboard). The learning journey I prefer to follow is one we, teachers and learners, choose together. We might plan a destination, of what we want to learn, but go slow enough to discover other things on the way, make changes, do detours, return to where we started to set off again in a new direction... and the decision to use many forms of "learning transportation". The thing is that if we get too fixed on the destination we lose opportunities of learning on the way. It becomes like a train track... efficient at getting us there, but does not leave much room to stop, explore and go at our own pace. We can still get to the destination too. Like getting to the top of a mountain... a huge challenge, to feel the joy, the wonder, the awe, and also a tinge of insignificance as you look around at the vastness and the number of other mountains. Only once have I ever been so high on a mountain that I started to feel dizzy - due to the fact there is less oxygen (altitude sickness)... but the view from there was amazing, doing anything physical was hard. But with this feeling of being small in the world, there is also this feeling of enormity in a kind of being one with the world sort of empowerment. It was not just the altitude! !, because sometimes I get that on smaller mountains, or with sunsets, or the beauty in the micro-world. That Dirk Gently "everything is connected" sort of thing. For me this is learning... not separate subjects, but how they all piece together to reveal the mosaic. A connectedness. Inspirational and empowering. But also times when it is challenging and overwhelming. I think as we do these learning journeys we have to follow our interests... as educators too. If we are not interested in the journey the children will know, the learning will not be the same. It is not just about following the children. We need to connect. The curriculum is, in a way, a set of instructions for us teachers... (as is the school law and local policies)... we need to follow them. But we also need to learn how to interpret them. What are those instructions in theory? How are they put into practice... ? Are there many ways to put them into practice? Which ways are desirable... which ways should be avoided... and why? Can following the instructions of the curriculum be detrimental - especially if too literally? 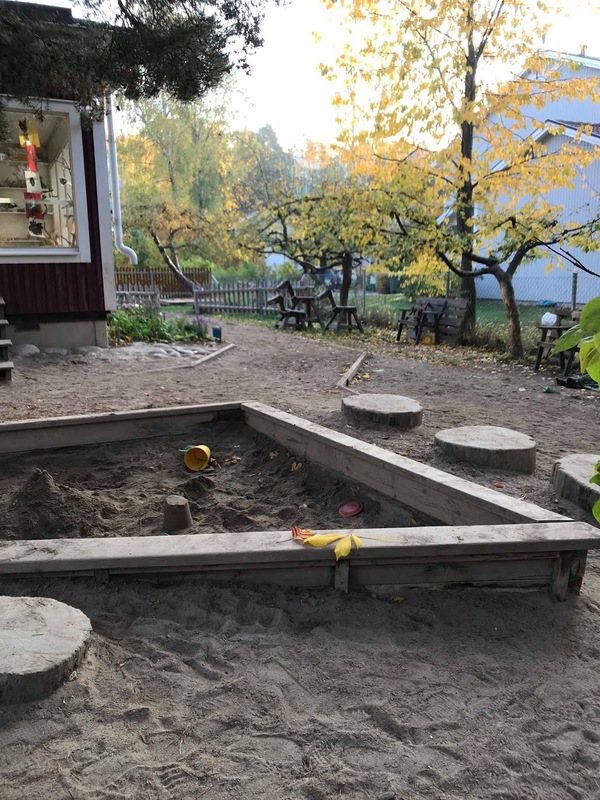 I often feel that in many parts of the world that educators no longer have the freedom to plan learning journeys with their classes, and even worse with their preschoolers - children who, I feel, really should not be following the instructions of "this is the way we learn" - children should be using the medium of play, exploration and discovery to learn. 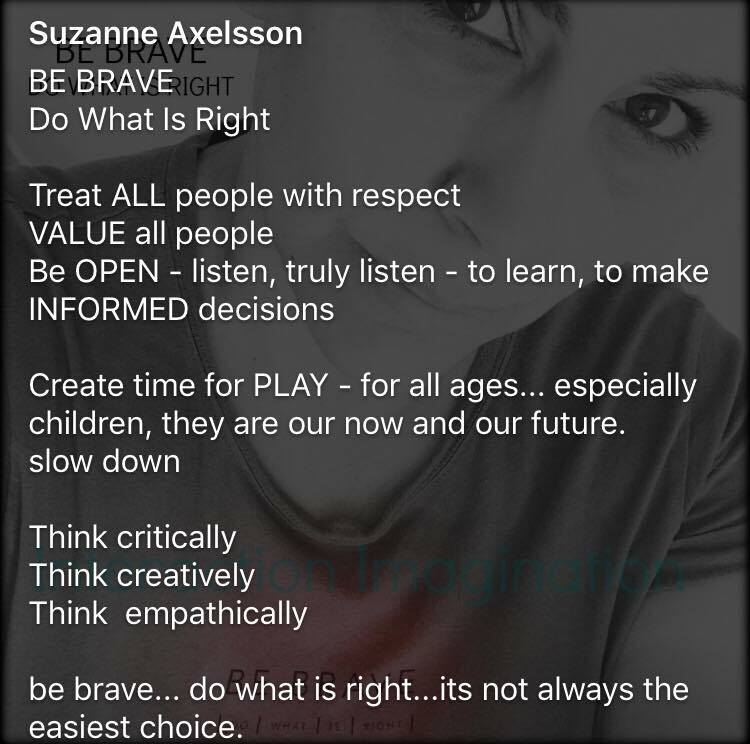 Instructions can be a part of that - those that keep us safe, healthy and encourage social well-being (ie not to hit to solve conflicts, not to use sticks to hurt others, to have empathy). We actually had instructions to help the children with empathically supporting each other - if you saw someone was upset you went over to see how they were, you asked if there is something you could do to help (not automatically assume they want a hug, or say sorry) you then did what they asked to the best of your ability (if you did not like to hug, you could put a hand on their shoulder instead and guide them to someone who does like hugging), you stay with the person, or find someone who can stay with the person until they feel ready to play (usually this took a few moments between children, longer when they sat with me). These are instructions I asked the children to follow, so that they could practice being socially empathic and supportive, but always on their own terms. And these instructions helped them understand that just saying sorry has no value if you do not mean it (the instruction of say sorry if you hurt/offend another child is one I think does not really work) and also they learned that not everyone feels better in the same way, or can offer support in the same way, but that we all do our best to help in the way we can. So in this sense following instructions is a good thing. But do children need to learn how to follow instructions? Well I don't think that should be a goal in itself... instructions can be a tool to help children learn something else... but it is not a learning destination, more of a form of transport. Too much following instructions will make it like being on the train tracks, with little freedom. I have more examples of how I have played with the idea of following instructions over the years... not to teach how to follow instructions, but to be aware and learn about all sort of things, mostly social awareness. But that is for another time... or one of my presentations... as they usually pop up i those. what is it that you want to document? What should you be filming or taking photos of or taking notes of? I think this can be really daunting... as everything is of value... yet we do not have the time to document or process everything. it is simply overwhelming. So why not start with a project for yourself? I want to learn about....? Once you have chosen your own inquiry you have to work out how can I find out these things. What kind of information do I need to collect? And how should I collect it. The children are learning and exploring about the world... you are learning more about the children. I have always chosen a question that I have felt I, or my team, have needed to understand better to become better educators, and more responsive to the children. 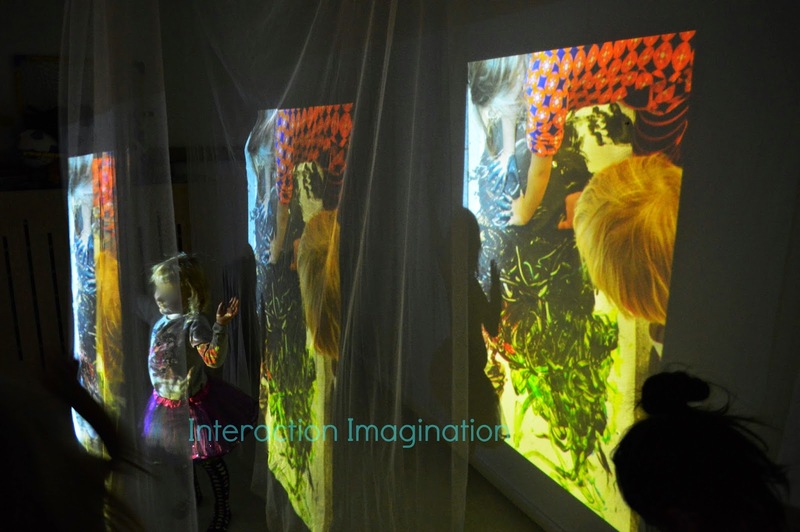 it means that I have taken images and notes to help me understand what the children know, what they are interested in and also to make visible their process. But also taken notes, photos and films that have helped me understand more about the children's learning and development or environment's process/impact. If I make changes I have the before and after photos - and notes about what impact those changes had, short term and long term. I also think that you need to set aside some time for dedicated documentation time... not the kind where you sit and create a document that gets published... but a time where you sit and really observe the children. I have always planned with my closest colleagues that I am going to spend 30-60 minutes observing and jotting down notes. So my colleague knows that s/he has the main responsibility for interacting with the children, while I try to make myself invisible. The children will often come up to me anyway, I do not want to hide away from the children, I simply do not want to be disturbing their play... and when the children ask what I am writing I will always show and explain... pointing out that they said this or that, or that they doing this, or were playing that over there and with these children... and explain that I do this so that I can learn more about them, so that when I plan activities, and excursions etc that it is based on what they like, what they feel is meaningful and that it is extending their learning rather than teaching them things they already know. In this way I am open with the children that I am still a learner... and also that their actions, their play is a way of participating in the planning. By writing who plays where and with whom, I get a good idea of the play constellations... I usually have a map/plan of the room where I put each child's initial in the place where they stand - I sometimes do this every ten minutes for an hour, just to see how the children are focussing on the play available in the room (sometimes with planned activities, and sometimes during free play) - and also to see if there is any child that is frequently on their own, and to explore why. Sometimes things can be easily missed. I do the same thing outside... even in public parks, jot down where and with whom the children are playing every 10 minutes... is the play different outside that inside? if it is, why? and also what can I learn from these differences. This meant we started choosing our outdoor spaces not just on what play opportunities they offered but also based on the needs of the group... for groups that needed more support with holding pens etc then the places that encouraged climbing for most of the time was chosen... when we seemed to be going through a few petty squabbles in the group, then the spaces that encouraged social play were visited. My observations and documentations meant we had a better understanding of how to use not only our own setting, but the local area too. This was information that could be shared with the rest of the setting and all children could take advantage of. Use this evidence, documentation to build theories... why do you think it is like this? if you make a change what do you think would happen? I think this process can be a good one to start with... as it is documenting YOUR learning process. 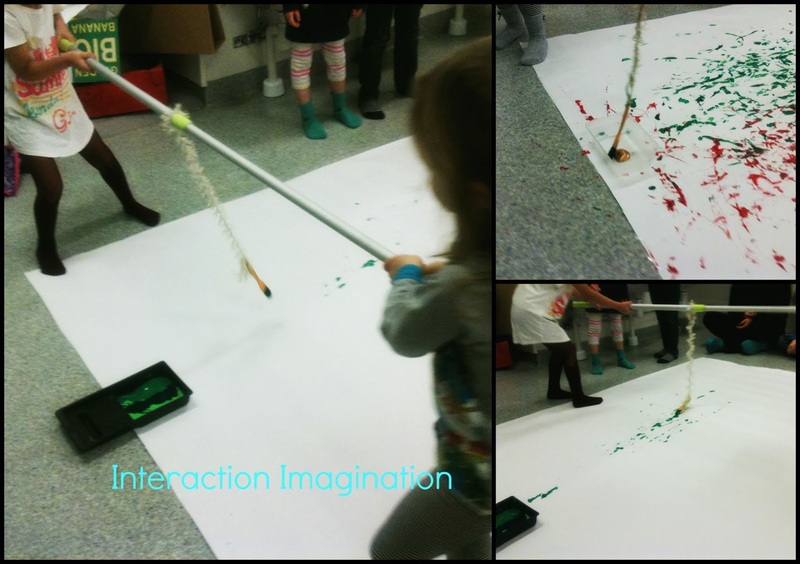 By doing this you can gain the experience of documenting learning processes that can be applied to documenting the children's learning processes. at the same time you are learning about the children and how they learn... making it easier for you to understand what needs to be documented at this time. what can I process, what can I analyze, and how am I to analyze? Proggetazione - this post I wrote together with Debi, about how we felt that many educators are not understanding the true complexity of project work with children... that it is much more than just a fancy name for a project... it is also enabling your own understanding of learning processes, and not just making the children's learning visible. Observations - easier said than done - this post was a reaction to the fact that I noticed that there was a gap between the usage of the phrase "observing children" and understanding what that actually entails. What is the difference between watching and observing children. What is documented of these observations? Why is it being observed, why documented? Child perspective and Child's perspective - the post explores the difference... and how important it is that as educators we not only plan from a child perspective but also the child's perspective... and this means being open to explore the children's ideas, reactions and understand their learning processes... as well as understanding theory of child development. documentation is a form of listening. 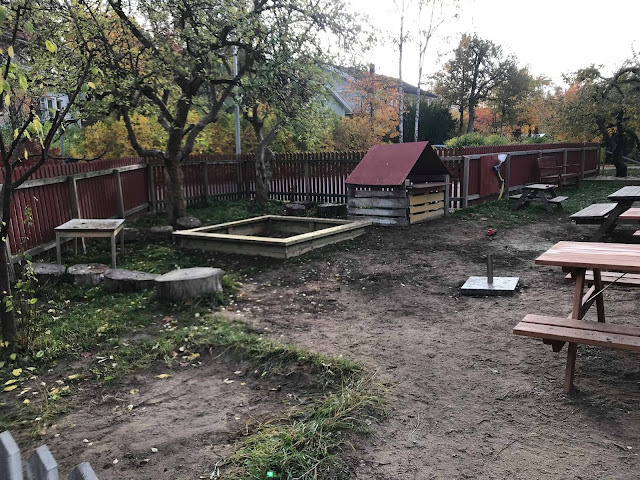 As promised a few of those photos from my last post about rain and shine preschools (I Ur of Skur) but with with some descriptions. The outdoor space had a lots of home-made equipment in a natural setting. The ground was flat, grassy, but also in places sloped (gently and steeply in different places) and with rocks too... so not only was there different equipment to play on there was also different surfaces to explore and challenge the body. 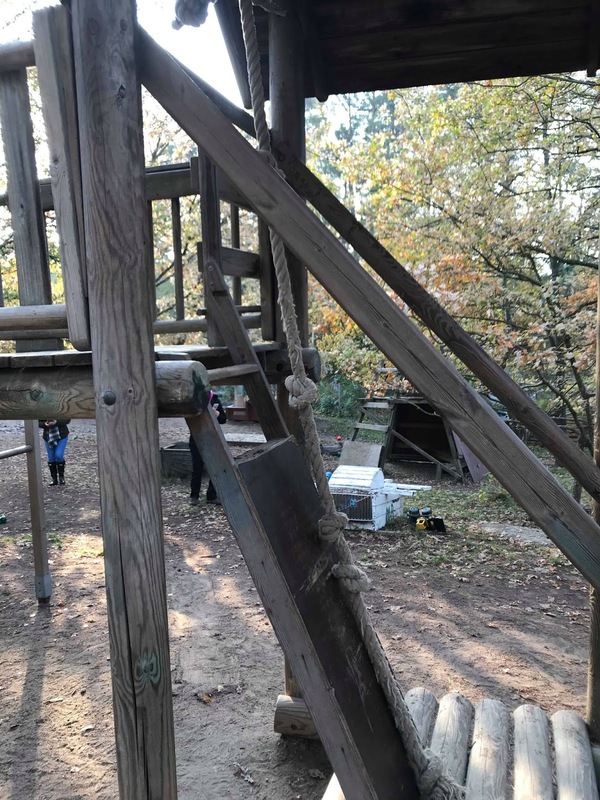 The equipment might have been mostly home-made, but it was well cared for and maintained... this means it allows for risky play, but does not present a danger to the children. The space was also huge... and with many hidden areas. For a small school this meant that at times there were areas that were "shut" to ensure safety. This did not restrict the children, as most spaces were wide and offered many options... what it did was ensure the children were within sight - even if they could go into creep-ins to hide, the teacher knew where they were. There were several wind-shelters allowing for a year round outdoor meetings - play is much easier to keep warm during the cold months - as when you are moving and active you are keeping warm. Sitting to eat or meet and talk is a time when the body can start cooling down... so being in shelters that protect from the cold wind (wind chill is not a favourite of mine... or most that I know) and there were also shelters with an even more wrap around shelter with fire pits, to help with warming up on the really cold days. again, as I mentioned last time... these preschools priority was to get the children to enjoy being outside, to be fascinated with nature and to encourage a life-long joy for outdoor activities... children that get too cold will not be enjoying themselves and are likely to develop a negative response to the outside... So being outside is great when there are spaces to warm up too... and to be outside for the right length of time to maximise on the fun and not turn it into torture. If the children are uncomfortable they will not be able to learn either. Getting the parents involved... this is a dry river bed during the cold months of the year... but during the warmer ones they switch on the circulating water system to create a great space for water play. 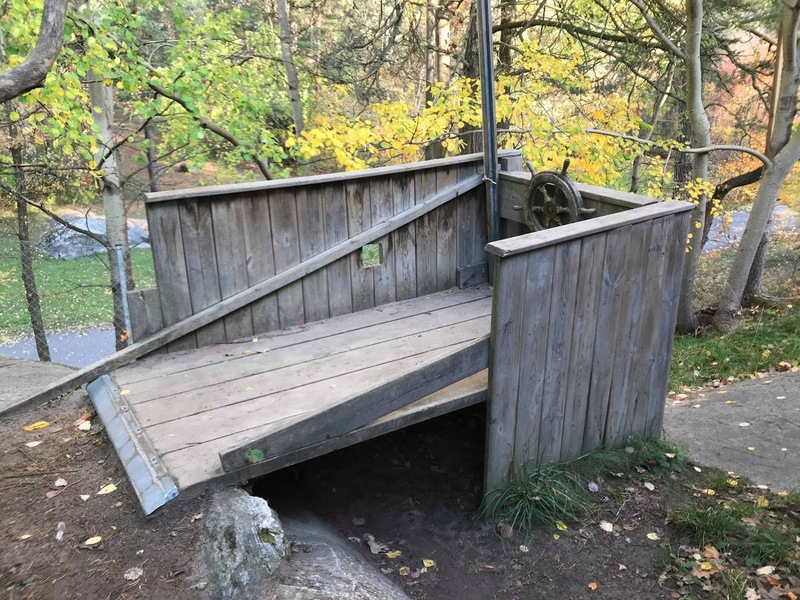 The parents built this with the staff. 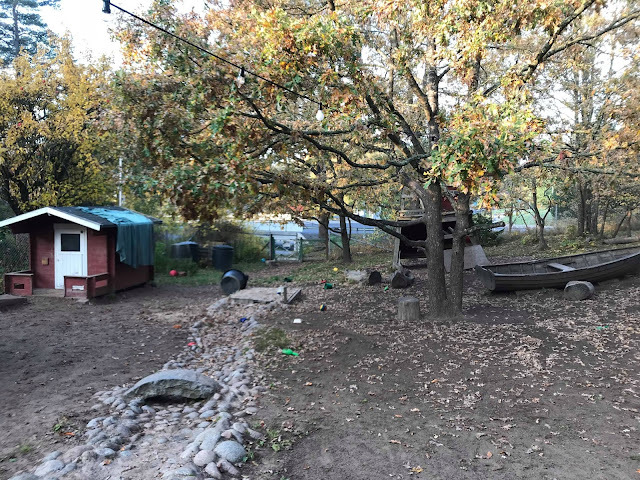 all playgrounds in Sweden switch off water play areas to prevent damage during the many winter months. 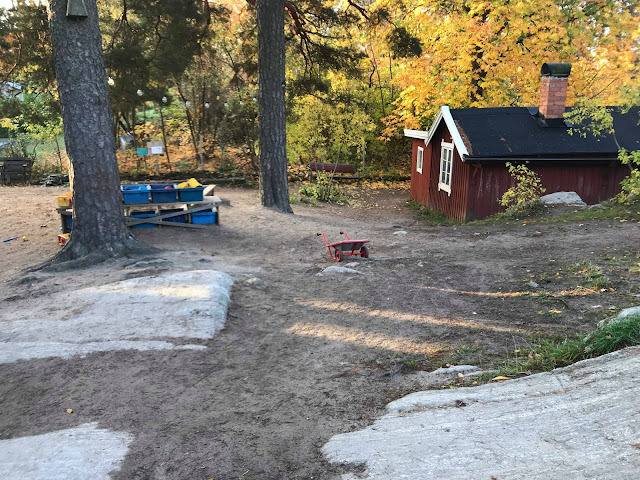 Despite having all this space... probably four times the size of the largest preschool garden I have worked at in the centre of Stockholm, the children are often taking trips out into the forest and to the lake which is close by. Next week I will share some of the images from their indoor facilities. 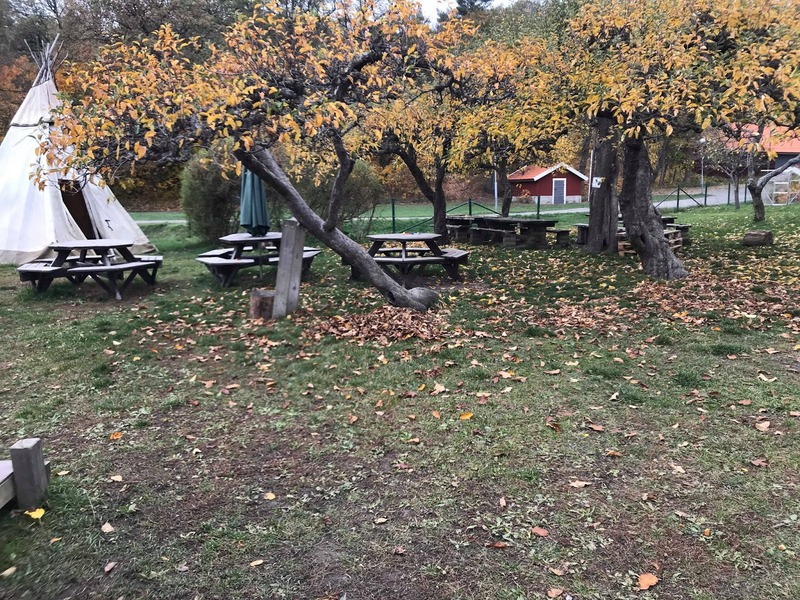 In October I visited two I Ur och Skur preschools on Lidingö, just outside Stockholm City. 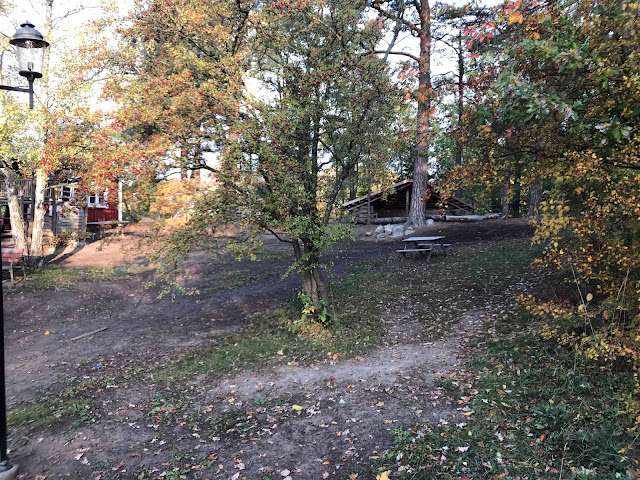 I Ur och Skur means directly in hour and shower (UR is an old word for clock, or a word outside, or original as urskog means virgin forest (original untouched forest) - it can also be translated as the saying Rain or Shine - as in come rain or shine = no matter what. 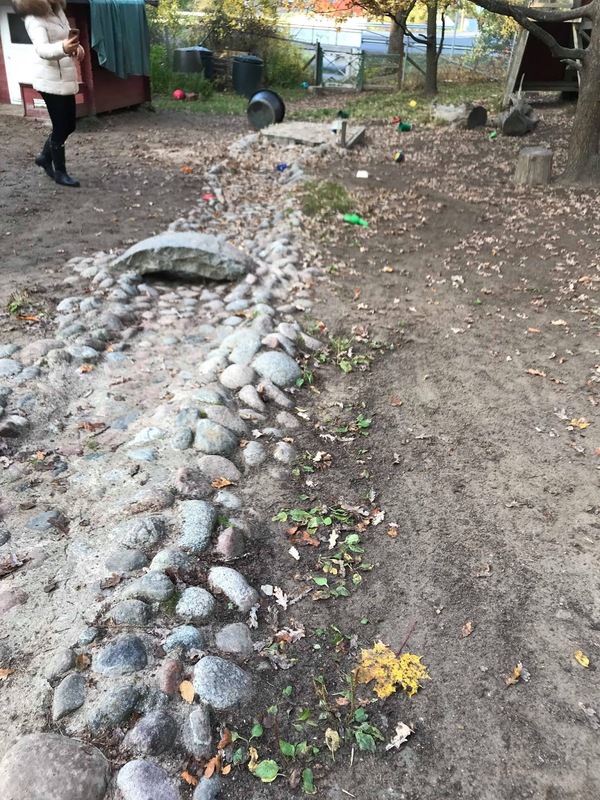 The preschools we visited were Stubben and Mulleborg... Mulleborg being the first ever I Ur och Skur preschool. 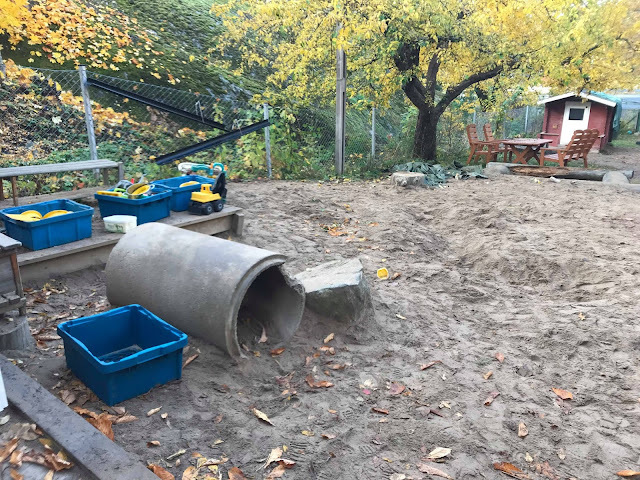 The indoor area was used just about every day, and in a way that supported the children's enthusiasm for being outside. The outside, the connection with nature was the focus but not to an extent that the children had to be outside. 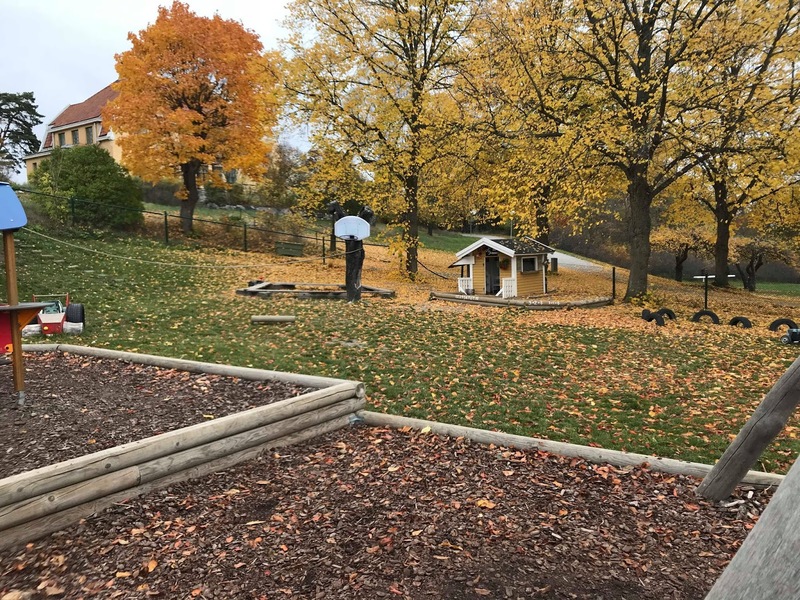 Of course the preschools were successful, the children loved being outside. 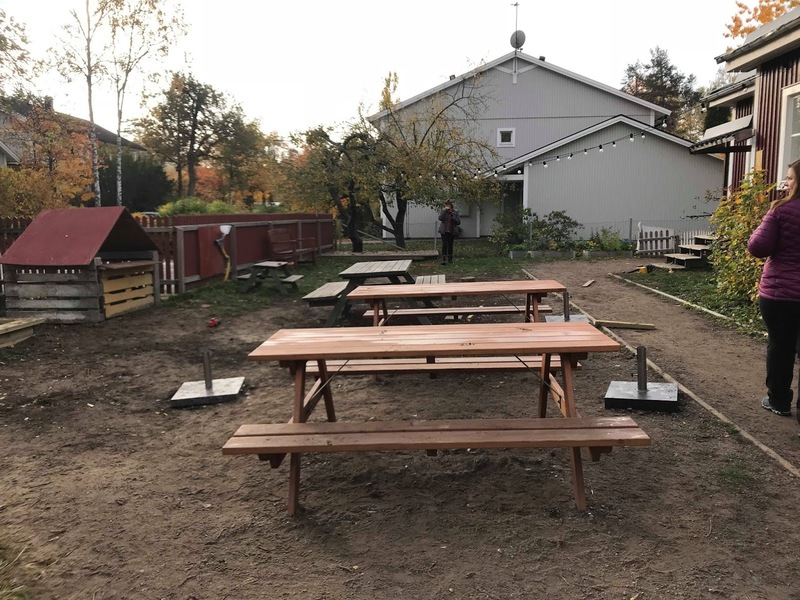 The preschools chose to not have large numbers of children... so both preschools had a huge space (especially their outdoor spaces) in relation to the number of children. They also had enough staff to be able to give the attention to detail that nature requires. This allowed them to go in different size groups into the forest to explore without compromising safety. 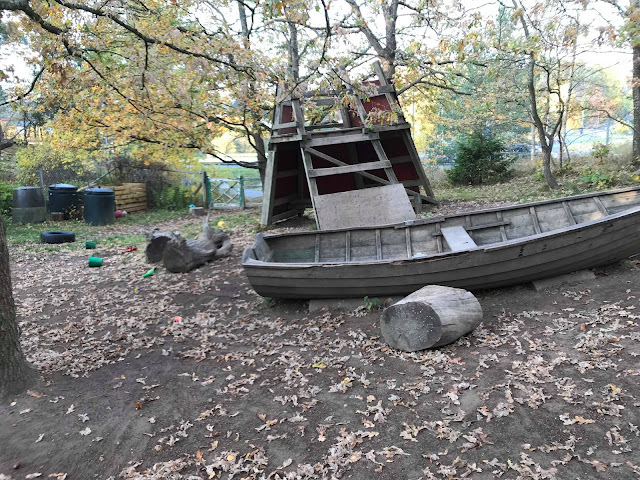 This means it gives children the space and time to engage in risky play without it being dangerous. Don't get me wrong it is GREAT that schools are getting out into nature and discovering children can learn there... discovering there is more than one way to learn. 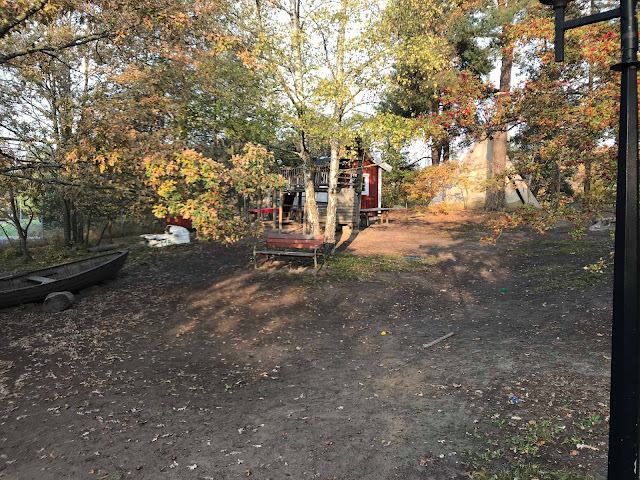 But in a way this is something children already know... maybe forest school is more about educating adults into understanding transdisciplinary learning, new perspectives on learning, and the 100 language of learning... not JUST in a classroom with workbooks and "set activities" - a kind of controlled play. 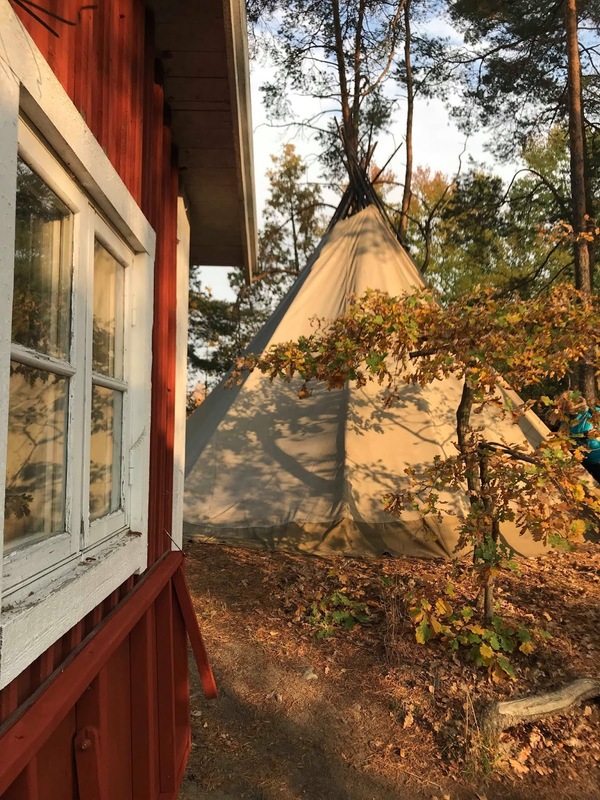 Forest Schools are important in many places because they are that first step for the school system to learn that traditional school is not the ONLY answer. But what I saw in these preschools was play, learning happening and being supported through play, freedom, social interactions being supported allowing for socially competent children (they have the space to develop at their own space, and not being forced into social situations before they master the skills/confidence due to small indoor spaces). I also saw staff that believed in what they are doing, and also had a great joy for the outdoors... which sadly is not always the case, even in most Swedish preschools where I have encountered at least one (often more) pedagogues at every preschool I have spent real time at, that have not liked going outside. And this infects the children. Creating a joyful and good relationship with the outdoors and with nature is essential. On that learning can be built. 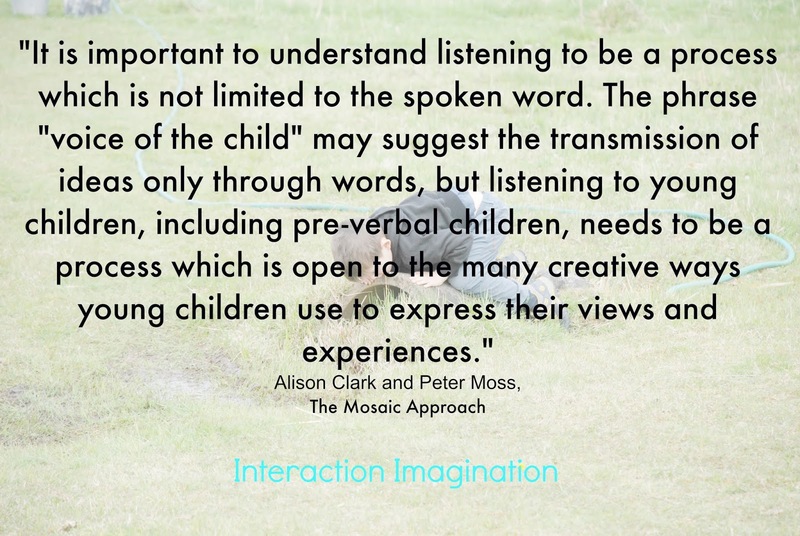 If the children are negative or do not feel safe or inspired, then the learning and the play is never going to be as deep or as profound. Or of the kind desired by the Swedish School Authority - "Life Long Learning"
I fully realise not all of you will be able to create the same thing... lack of space, or policies that restrict. BUT the images can still inspire you to think what you can do in your own context. The images are in no specific order... and in this post there will be no comments. Tomorrow I will share some of these photos again, with comments and reflections. I actually did not expect to write another in the series so soon, I was going to pace myself to one a week... but I have found myself in a situation where I feel compelled to write. BUT what upset me the most was the fact that one educator told some children to lift up their magnifying glasses, that they had brought with them, to look at the enormous T-Rex replica skull which was too far away for the magnifying glass to be effective, and also the child held the magnifying glass in such a way that it would have been impossible for the skull to have been in focus. I mean what does learning look like? How can we support educators to use cameras to capture learning moments? 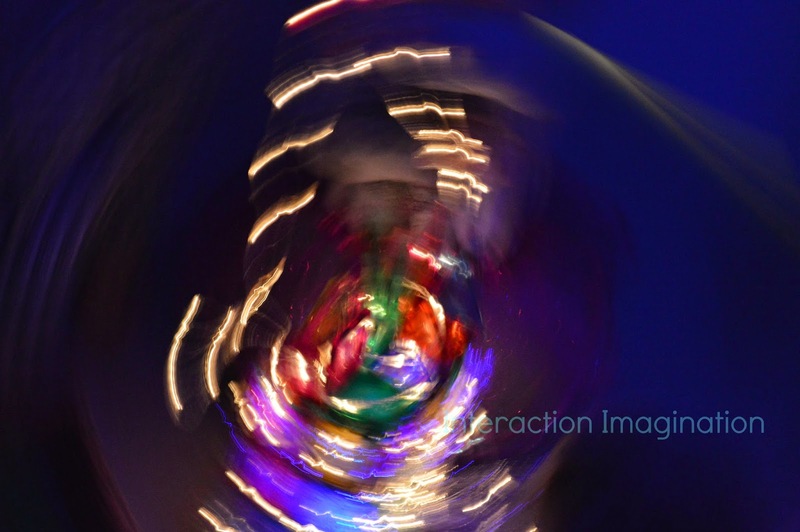 How can we support educators to think critically about the types of photos they are taking? How do we support educators to reflect on their input... is this the child's learning, or adult down teaching... or posing? Is posing a bad thing... I mean if you miss a moment, is it OK to ask children to do it again so you can capture it? Is this fake learning, or just an attempt to record the original that occurred. I observed several preschools as they moved around... and learned so much... but the range in quality was shocking... from the fake learning photos, telling the children the WRONG information about the exhibition as they went around (and corrected the children when they tried to say what they saw, which was actually right) and constant usage of "don't" and "no" to the amazing calmness of a group fired by curiosity, talked to with enthusiasm, knowledge and respect... one child wandered off (just a short distance) and one of the educators quietly moved over and gently talked with the child, acknowledging what the child was looking at and encouraging them back to the group so they could listen to the next part of the story... It was clear this group of children felt secure, and they had more time and energy to focus on learning and participating in that learning. It was a joy to watch. And I had to go over to them to let them know how amazing they were... it is SO important with positive feedback. I also saw that they seemed to have a pre-arranged their educator roles for the visit. One guided the children, told the stories and had the main interaction, another was there to back up and support the children in observing and listening and participating and the third was taking photos and films and also interacting to show her enthusiasm for what the visit. By the teachers knowing what their roles were made it easy for the children to feel security. I could go on abut the visit... but I will not as the purpose of this post is the documentation. So what happens when pieces of the learning mosaic are false? How can the teacher really understand the children on an individual and group basis if facts are closer to fiction? This is something that I had not truly considered before. And now will spend some time reflecting on... how can we support these teachers to be able to document the facts and to learn from them. That documentation is not about proving you are a good teacher, but a method of learning about the children and the processes of learning and play.